The first thing that hits you when you enter Fisherman’s Pier is the smell of salt-water, fresh fish, and diesel that is only found on a city waterfront. My first impressions of Fisherman’s Pier, home to the offices of Save the Harbor/Save the Bay, are ones of admiration and warm familiarity. Having grown up on waterfronts, both in New Haven, Connecticut and Portland, Maine, the smell and scenery are ones I enjoy. The admiration, however, comes from the impressive buildings along the wharf and modern landscaping on the close city blocks. It almost looks like a movie set; the sun shining off of the clean building windows as well-dressed businessmen and women go off to lunch at the contemporary restaurants and markets. A few tourists blend into the walks along the docks and admire the variety of ferries, sailboats, touring boats, the well-known Nantucket Lightship, and tall ships. Impressive in itself, the bright white and green, varnished, three-masted Mexican naval ship Cuauhtemoc is docked at the World Trade Center Seaport, sitting under the many flags and flying a variety herself, adding to the secular feel the international seaport gives off. 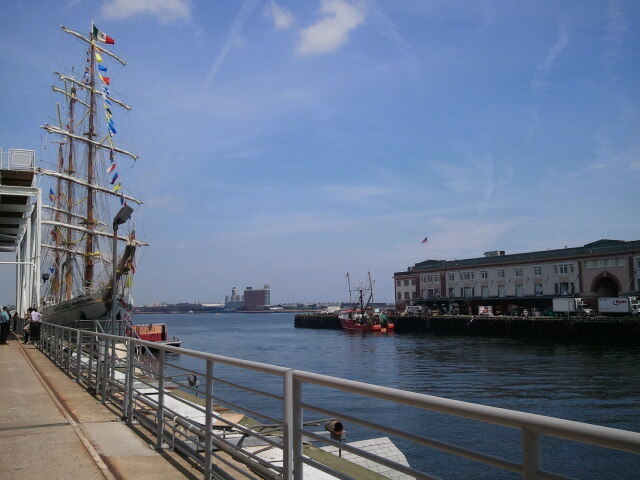 Sailors in uniform and crewmen bask in the Boston sun, listening to festive Mexican music playing loudly on the ship. Moving down the pier, the industriousness of the place comes into full effect. Though the fisherman are long gone, having dropped their catches off early in the morning, workmen tend to boats docked on the pier cleaning and tossing pallets back and forth. Tourists take pictures in front of the famous No Name Seafood Restaurant, and MassPort policemen patrol. 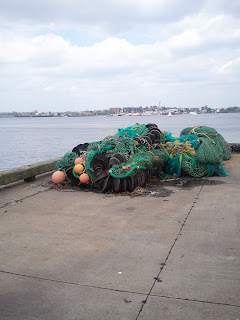 By the time you get to the end of pier, you’re tripping over tangled nets and buoys and have a full view across the harbor, full of recreational, industry, and tour boats. Planes from Logan Airport are loud and close by. Pick up trucks litter the back parking lot with various equipment tossed in the back. The environment leaves me with no doubt that this will be a fun and beautiful, as well as educational and interesting, place to work for the summer. As I dragged my lazy feet through puddles of murky water this morning, all I could think was “Where is Northern Avenue?” I wandered around for about an hour, passing ocean front restaurants and the World Trade Center building decorated with flags from across the globe. I eventually did find Northern Avenue, but 212 – or any numbers in the two hundreds for that matter, was nowhere in sight. The salt water aroma was unmistakable as I walked past the Fish Pier and a sign that read “Fish Tenants only”; I assumed that no office buildings would be there. To my surprise, the very building I had been searching for all morning was right on the pier – about as close to Boston’s illustrious harbor as you can get. My first assignment as a Communications Intern was to familiarize myself with the Save the Harbor website and what our mission is. I found this blog and read through some old postings to get an idea of what exactly I’ll be doing this summer. Pictures from past events especially caught my eye, particularly the “Cupid Splash” into the freezing February harbor, the bright smiles on children’s faces holding fish they caught, and the sandcastle contest on the beach. As an avid beach lover myself ( I’m Long Island born and raised) I felt like I had made the right choice in accepting the internship. After playing around with the Save the Harbor Facebook page and publications, the other interns and I were called into the office to meet our bosses and have our first meeting. I was still a little unsure of what all of my responsibilities would be, but my boss Bruce explained it in simple way that seemed to answer it all: “Communications is everything.” And it really is – to keep up the success that Save the Harbor has had with cleaning Boston’s beaches we need to spread the word to as many people as possible. When the meeting was over, two of the interns and I were told to explore the area to find pictures and other inspiration for the blog we’ll be writing all summer. We were allowed to take pictures of anything we wanted, and yet I found that almost all of mine were of the tall ships in town for the Expo. Although I’ve lived in Boston for the past two years, I never had the chance to spend a sunny day by the harbor, and I’ve never seen anything like the one particular white sailboat that became the star of my photo shoot. Finally, we were told to start putting together our blog. Overall, my mind is filled with all of the possibilities this summer holds; experience and skills for resume building, meeting new people and making new friends, and hosting fun events on the beach. I can’t wait to see how all of our hard work will teach thousands of Bostonians why we must continue to keep our harbors clean and sparkling blue. 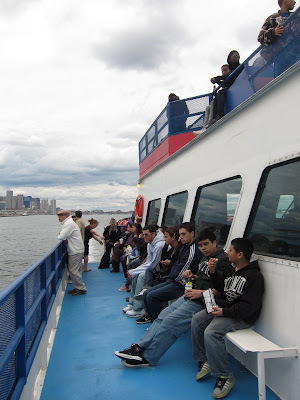 I was so excited on April 30th as I was going to assist a marine mammal trip with so many cute kids in Boston Harbor. It was a big free event held by Save the Harbor/Save the Bay. Actually I had never seen seals and porpoises on the sea but I did it this time. On that day, my professor—Bruce served as our tour guide on the boat, teaching us how to observe marine animals. It was great fun to travel with tens of funny and excited children. They kept talking about the sea and running everywhere to catch sea animals. They were curious about everything.They simply kept the boat active and interesting. I loved the big smile on their faces when they were discovering marine mammals unexpectedly. When I was taking pictures for the warm families, I felt how happy they were to enjoy such a happy trip with each other. It made me think of my families. Thanks to the nice weather, everything looked perfect. I enjoyed the sea wind flowing through my hairs. I enjoyed the seals hopping in front of my eyes. I enjoyed the airplanes flying so low just like on the top of my head. I enjoyed watching the beautiful islands and scenery. I enjoyed myself and everything else during the trip! What’s more, I was so grateful for people who donated in my donation box. My name is Kristina Acevedo and I was an intern from Fenway High School. Part of my graduation requirement was to complete a six week internship. I struggled searching for an internship, but my teacher had told me Save the Harbor/Save the Bay were looking for one. I took the chance to meet with Michelle Palermino one day to get more insight on what kinds of task I would be doing. I remember seeing Michelle with a huge smile on her face when I walked into a room set up for my interview at school. Our conversation started off great. I felt comfortable speaking to Michelle and she showed so much excitement! She sounded so passionate when she spoke about Save the Harbor/Save the Bay. I decided to take the internship. It sounded like fun, and especially hearing about the event they were hosting the Cupid Splash. My first day there I met the staff. I remember meeting Caitlin first and how much she loves peanut butter! The vibe I got from the office was perfect. I knew I was going to have fun. I was going to be surrounded by a staff of passionate, humorous and dedicated people. I was kept busy throughout the six weeks, and was able to gain a wonderful workplace experience. My first week there, I had to develop and speak at the staff meeting. I felt involved with everything that was being done in the office. I am greatful that the staff trusted in me when it came to projects. I was able to complete two collages for collaborative material, help organize an event and draft a welcome intern packet. When I compared my experience with my fellow classmates I noticed that I must have gave a great impression and showed dedication just like the staff because I was given the opportunity to help with important task. My classmates filed paperwork and organized papers at their internship; meanwhile, I was treated like staff and given assignments that would have been done by the staff. Apart from working indoors for the six weeks, I was able to work outside at the Harbor with families from different areas of Boston for the Marine Mammal Safari. I was able to network with hundreds of people, and enjoy the search for Harbor Seals and porpoises with my family. Overall I gained a lot of experience here at Save the Harbor/Save the Bay, and if it was not for my spending my summer vacation in Puerto Rico I would have loved to work more with them. Sadly this Friday is my last day at Save the Harbor/Save the Bay. :( I just want to thank Michelle Palermino and Patty Foley for allowing me to intern here for the six weeks. If it was not for them accepting me into the office I would have not gained the same experience anywhere else. I am blessed to have met, worked, laughed and talked with such a passionate staff including the other interns. I would definitely recommend looking for an internship at Save the Harbor/Save the Bay for the experience and skills that would be gained. Marine Mammals in Boston Harbor! This past Saturday, we at Save the Harbor / Save the Bay held our favorite Springtime tradition: the Marine Mammal Safari! Families from all over Massachusetts (and a few visitors from across the country and world!) joined us for one of three exciting boat trips in search of harbor seals and porpoises. We packed the boats with families and community groups are we were off! Our Baywatcher Bruce Berman instructed everyone on how to keep their eyes peeled for signs of seals and porpoises in the water around us. Two hundred sets of eyes peered over the railings of the “Freedom” for signs of dark seal noses bobbing in the water or for the exciting sight of a porpoises’ back and fin breaking the surface. Everyone got so excited each time there was a sighting, rushing to the best part of the boat to view the seals. It was so fun to see the kids so involved in the search, calling out to everyone else when they thought they saw something! And even if we hadn’t seen any seals or porpoises, it was a gorgeous day on its own; and I know everyone docked with more knowledge about the Harbor and the Boston Harbor Islands too! I was thrilled to be a part of a free and fun event that could bring families together in the context of the magnificent resource that is our Harbor. 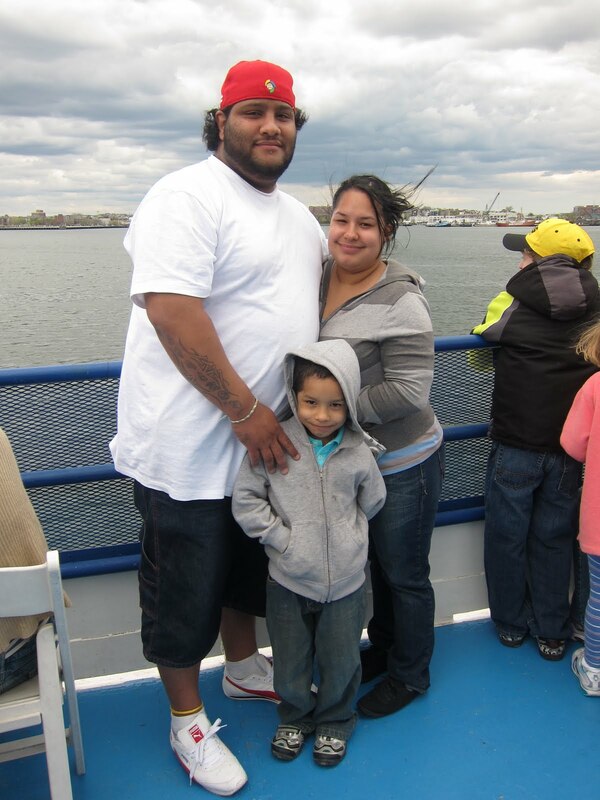 My favorite part of my job is helping to connect new people to the Harbor and giving them an opportunity to share it with their families. And I love whenever I’m there to see it in action, and see the smiles on all the kid’s faces as they fall in love with being on the water. I’ll see you around the Harbor this year! It’s our 25th Anniversary, which means we have 25 years of hard work, passion, and success to celebrate, and, as a result, clean water to enjoy. I don’t think the events and the parties around the Harbor this year are going to disappoint, and I really hope to see you there! Up for a Harbor Adventure? This past Saturday, Save the Harbor/Save the Bay hosted the Marine Mammal Safari. It was the first event I attended after interning here for four weeks, and it was my second time out on a boat. It was great seeing all the energy families had early in the morning, and how families from communities all over Boston were up for an adventure to find Harbor Seals and porpoises. As the children waited patiently in line they guessed what a porpoise was and what it might look like. It was not until Bruce began to give us tips on how to spot them and Harbor Seals when the kids finally knew what a porpoise was. Bruce had given us a preview of what a porpoise sounds like and it went like this "...(SILENCE)..." Everyone laughed and smiled and it was so great to see that they were enjoying themselves. Everyone participated in the search for Harbor Seals and porpoises. Some used Binoculars while others were able to use their great eye sight. We were able to spot a few Harbor Seal on rocks, but the porpoises were shy. I found it amazing how Bruce would announce a Harbor Seal sighting on one side of the boat and everyone would run with smiles to take a look. When finally spotting it, faces would glow and eyes would shine. It was great to see all the joy it brought to people, and I was glad to experience this event with my family and to show them the passionate people I work with at Save the Harbor/Save the Bay. This past Saturday, I, along with the rest of the Save the Harbor / Save the Bay staff, hosted the Marine Mammal Safari on the Boston Harbor on what seemed like a perfect sunny morning for a cruise around the Harbor. I found it to be a great experience. 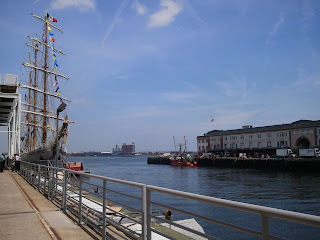 This was my first time that I really got a chance to enjoy the Harbor, even though I have been in Boston for almost four years. Also, learning about the animals that are living in the Harbor was great because I know that they now have a safer environment to live in than they did about 20 years ago. Lastly, the looks and reactions on the children's faces priceless! The second trip of Save the Harbor’s Annual Marine Mammal Safari started at 1:45p.m. in April 30th. Everybody felt so excited while getting on the boat. Big smiles came up on everyone’s face. In the beginning, layers and layers of clouds were pressing to the sky and made it look heavy. However, when the sun came out an hour later, everything became nice and calm. I saw this man resting on the deck, reclined, lifted his head towards the sun without saying a word; this girl wearing a cute pink jacket stepped up on the chair and gazed at the spray from the stern. There was a couple holding each other, watching the light house on a small green island. Children were playing with each other with laughter rolling around. The sun was so bright, it lit up their face with a natural flush. It was always a mystery of this original intimacy between human and the sea, like a basic instinct so deeply rooted inside our hearts. People can easily find the peace and purity of their soul near the water. It was a kind of connection, a call from the earth. Take a deep breath, you can smell it, the scent of home. Life was born in this blue. As long as we are living, we do everything to defend our home. April 30th was a great day for the Marine Mammal Safari boat trip hosted by Save the Harbor/Save the Bay. As part of our free family events this spring and summer, over the course of the day we brought more than 600 people to the Boston Harbor Islands National Park to see the seals and porpoises that visit the Harbor and the Bay each spring. I assisted on all three boats for the whole day as part of my internship. I woke up quite early that day and went to the Rowes Wharf to meet our staff, ready to work to make sure that all our guests had a good time on our first great boat trip. The weather was kind of chilly and cloudy in the morning, which made us concerned that the weather may affect the trip. Fortunately, it turned out to be sunny right before our first departure, which was great! Bruce was there narrating about all the Boston Harbor, the islands and marine mammals along the way Everybody on the boat enjoyed the trip so much; all the kids were especially so exited when they found harbor seals swimming around our boat. The porpoises were kind of shy that day and we didn’t find a lot of them. However, it didn’t affect the whole trip a lot and everyone had a good time on the boat trips including all of our staff! We took so many pictures of families from around Boston and even some from all around the world. In those pictures, the smiles and laughs really make us proud of what we are doing as a team at Save the Harbor/Save the Bay. After the whole day’s work I felt a little bit tired, but I spent quite a wonderful day and had tons of fun there. It was such a great experience having interned at Save the Harbor/Save the Bay, which is filled with a lot of fun events and passionate people in our team. Now we are getting ready to host more awesome events this summer as part of Save the Harbor's 25th Anniversary, and we hope more and more people and families can join us and enjoy our great harbor together!